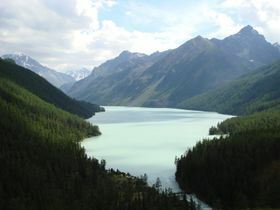 For other places with the same name, see Altai (disambiguation). 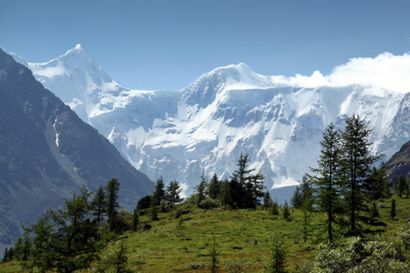 Altai (Russian: Респу́блика Алта́й rees-POOB-leek-uh uhl-TIGH)  is a republic in Western Siberia, which has an amazing variety of landscapes: from boundless steppes to impassable taiga forests. Very little is known about the region. The people are mainly ethnic Altai's, a Turkic related ethnicity, following a wide diversification of religions such as Russian Orthodoxy, Shamanism, Buddhism, thus having the honour of being Russia's most religiously diversified regions. The modern Altai economy is based largely upon agriculture, but nowadays the tourism industry has underwent an exponential growth. 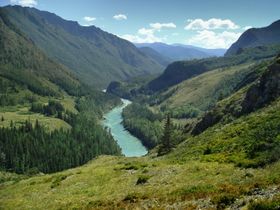 The Altai Mountains are the highest in Siberia. The route goes through the spots of Roerichs expeditions, through southern Altai. The Altai Republic and nearby Altai Krai were very popular hunting, fishing and adventure tourist sites during Soviet times. The region is popular for rafting, kayaking, rock climbing, horse riding, fishing and hunting. Despite the rapid growth of tourism, the region is one of the poorest and most underdeveloped places of Russia. However, if HDI is taken into account (0.748), it remains as one of the richest places of Asia. Northern shores of Teletskoye lake close to Iogach and Artybash villages. Complex of campsites along the Katun river, known as 'Biryuzovaya Katun', Бирюзовая Катунь, all accessible from Chuysky Highway, which runs parallel to the river. Riverside campsites continue south with tributary Chemal and are mostly concentrated in Chemal village. To get there tourists buy tours in big cities or call to the owners beforehand and then arrive. One can try their luck and certainly will find a stay on the spot. In the 2010s, nearly any village on Chuysky Trakt got a camping or tourist base, so it's relatively easy to find a place to stay overnight if you travel by that route. It's best to call in advance if you travel to the more remote areas. The Altai are a Turkic ethnic group closely related to Kazakhs and speak their own language of Altai. Russian is spoken nearly universally, but it may be hard to find a Russian-speaking Altai in remote areas like Chulyshman valley. Kazakh language is also prevalent is some villages. The easiest way to get to Altai Republic is to take a direct flight from Moscow to Gorno-Altaisk. There are regular flights two times a week. The town can also be reached from Biysk, Barnaul or Novosibirsk by bus or "marshrutka". Taxi from Biysk is quite cheap too. Marshrutka is the most common way of public travel there. It is some kind of bigger taxi, which goes once it gets full. Hitchiking is quite common too. Sometimes you can stop even a child on a horse. 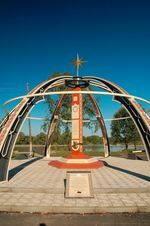 KM723-732 from Novosibirsk: A series of ancient (10,000BC) rock paintings and carvings can be seen on the main road bypassing through Altai Republic. Eat at kafes, it is cheap and quite good. Kafes can are easily be found in Gorno-Altaysk, Mayma and more "civilized" Сhemalskiy region. However there are few if any in other regions. Be aware of ticks, mainly in summer (especially in May-June). Vaccination agains tick-borne encephalitis is not mandatory for travelling but strongly recommended! The region is prone to earth-quakes. Tap water is considered unsafe for drinking, and should be avoided. Since being one of Russia's poorest regions, only 60% of the population have access to safe drinking water. Sanitize all water, and drink only water that is bottled. The central republican hospital is located in Gorno-Altaisk and is well equipped. Regional hospitals are located in the biggest villages and possess basic diagnostic facilities. This page was last edited on 24 January 2019, at 07:21.